The Brewing Forum • View topic - Fantom(B)e(ar) - Farmhouse Sour. Impromptu Saison brew day! I should have asked Serum for some tips before kicking off, but decided on the spur of the moment to brew this. Ive brewed one 16L batch of saison before and it was fine. The Belle Saison yeast didn't really impress me and I split the batch three ways; clean, orange and raspberry. Enjoyable, but really lacking in complexity. Going for something very different this time. This should be a lightly sour and funky table saison to drop into my nice new Belgian bottles at around 3.5 vol co2. 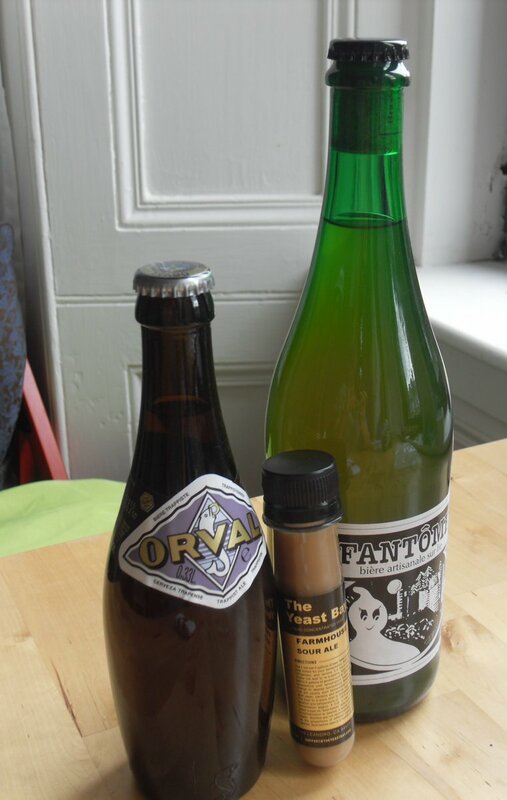 Discounted vial of Farmhouse Sour (Sach + Lacto), Orval (Brett) and Fantome (who knows?) going in the primary. I guess that you had to drink the beers while brewing? Rolfster wrote: I guess that you had to drink the beers while brewing? I did. And my first Fantome. Fruity, boozy, vinous.. slick? Not very heavily carbonated. Certainly an intriguing beer. More fun than just handing £7 over to White Labs that's for sure! A bit more dangerous though. I'm a complete lightweight . No starters for the dregs as they're only going into 8l of wort and I am lazy. Sounds like it'll be full of flavour. You really don't need a starter with Orval dregs, they're pretty resilient and the white labs vial will have all sorts in there I imagine. I'll be lining up for a bottle swap! Have you got anything lined up to go into the yeast cake? 8L with that in would make a good starter for something else.... just a thought! Rolfster wrote: Have you got anything lined up to go into the yeast cake? Very happy to do a bottle swap Serum. Definitely need to educate myself when it comes to saisons. I'm not sure yet. I've been thinking about something in the style of orval, but I forgot to add Caravienne to my order, but a light crystal would probably be a reasonable substitute. There will be a lot of lacto in the yeast cakes, but higher IBUs would probably keep it in check. You really want some Belgian pale in there as it's really bready. Totally makes the beer. Some biscuit might help if you have it, even some marks otter or something. I used hallertauer for bittering and bobek for late and dry hop and it was nice. Sneaked a sniff and it smells fantastic so far. A million times more intriguing than Belle Saison. Temp up to ~25c and krausen dropped. This one will probably take a while to reach FG though? Forgot to add that it's also my first time using brett, so I'm sticking to glass demis for this brew. Keeping my bigger plastic buckets for clean brews. I've got two near full with about 4L in each. I'll probably try to resist the urge to treat them differently, although I'm not sure if I really want to dry hop this beer given the aroma provided by the yeast alone. Two weeks since brewday so it's time for a gravity check. My first proper mixed-fermentation so I'll be cautious, but hopefully the yeast and bacteria have gotten through a lot of the fermentables. I just need to get up.. sanitize etc. Lightly tart and 1.004 (4.8%) with just a hint of that Fantome sweet/boozy character. The main question now is whether to bottle or bottle or dry hop? There's a lightly lemony and zesty aroma, but given the Brett I'd imagine this will evolve in the bottle. If I decide to bottle I should be safe from a gravity of 1.004.. right? Especially given my big Belgian bottles. As i understand it brett eats sugar but it'll also eat esters and things like that which won't drop the gravity. I dont know if that releases co2 or not. The base Orval yeast doesn't finish all that dry whereas yours is quite a bit lower. It's hard to say how far it'll go but if you use strong bottles and you go easy on priming you should be OK. The other alternative is to age for longer so you can prime exactly how you want. Waited a week and gravity still stable still at 1.004. I'll bottle tomorrow and aim for around 3.2 vol. of co2. I'm not sure how to really assess this as I've not got much experience with saison.. It's certainly pleasant (hydro sample no.2), but perhaps slightly one dimensional at this stage. Although given the Brett it should probably be given a few months in the bottle. 1004 can't be far off final. You might find it works to prime just below what you're after in case you get a little more action. Whenever I've gone above 3 vols it has gushed out the bottle but there might be something else wrong with my process. Re: Fantom(B)e(ar) - Farmhouse Sour. Almost hit 20c in Edinburgh today and that pretty much counts as a heatwave in my book. Saison time. This went down very nicely.. gushed out the bottle, but I *think* that was because I disturbed the yeast when I put the bottles away into cupboard/fridge. They were crystal clean when I moved them from horizontal - so that a big pellicle doesn't form around the top of the bottle - but the yeast doesn't compact nicely. Taking this to the homebrew club later in the week, so hopefully some more detailed feedback then. I'm pretty happy with it for my first mixed fermentation saison. Tart, lemony, sessionable and a wee dose of something fruity from the Blanc. I gave this a try tonight and you've gone a real good job. It tastes bang on midway between a dry saison and a lambic. It came out a bit hazy but this sort of yeast never seems to pack down! It's a nice pale hazy colour with a bubbly head that fades but that's what you expect with sour beers. It's sour but not quite as bracing as a gueuze. The aroma has a bit of brett but not loads. You get a bit of that chewy wheaty aftertaste which is nice. You've got a real depth of flavour considering how long it's been since you brewed. I might have to try one of those yeast bay vials at some point. It's a really nice beer. I'd be interested to see what it's like if you upped the wheat or spelt. I think that would make the aftertaste hang around a bit longer but you're pretty getting even closer to making lambic if you do that. You mentioned you thought you were getting some suplhur but I'm not getting any flavours that are out of place in this sort of brew. serum wrote: I gave this a try tonight and you've gone a real good job. It tastes bang on midway between a dry saison and a lambic. Thanks Serum. Good to get some feedback! Glad it didn't smell like farts . I can't help but think the beer still comes across as a wee bit simple? Would be interested to pick your brain a bit more below..
- It does need a bit more influence from the grain. I think more Spelt/Wheat goes with it as you suggest think? Boring alternative is Munich. I don't think the relatively soft character of this beer would fit rye..
- Yeast character. This fermented around 25c, but does it need more heat to get some more out of it? - More alcohol? The lazy way out.. it almost always helps, but don't want to create a monster. 4.8% is a good easy strength. - Increase head retention by pre-acidifying wort slightly pre-ferment. Oh and Farmhouse Sour is on sale for £3 at the Malt Miller right now..
More booze will give it another dimension as it's just on the threshold at 4.8% but you might not have to go that far with it. I'd say pick either wheat or spelt and use somewhere between a third and half of the grain bill. I don't really know what the oats are bringing so I'd lose those. I find lambic and also beers like Saison d'epeautre have a really long wheaty aftertaste and it would definitely add something good. When StevieDS sent me his Berliner weisse he'd managed to pull that off so maybe ask what he did with the mash and have a go at that. At a guess I think it's the higher proportion of wheat in the grain bill. Spelt should do it too as it has a similar taste. Saison D'Epeautre has a third spelt and a really bone dry finish so it's along similar lines but not sour. If you wanted to try munich that could be pretty good but it would send you off in a completely different direction. I love munich so I'd probably do 80% Munich I and 20% Pilsner and make it much darker. The sourness is always going to overshadow the pilsner. I don't know how it would go with the munich and there's only one way to find out. It's a quick sour so I don't think you're ever going to get quite the same complexity you get with a lambic but it's good. Saison is always going to be a simpler beer. You might find more age will change it or different fermentation temps but I'm not an expert in making sour beer (more an expert in drinking it ). Thanks again! Second version of this recipe has been done now. You can expect your bottle in a few months . Once I've got the lager through my fermentation fridge I can start this. Plan is to take ambient up to ~27c. My mixed fermentation rye saison withSaaz and First Gold is down to 1.003 and ready to bottle. The pellicle is fascinating. I used half the yeast cake from this brew for it, but hopped to 30 IBU to inhibit the LAB.. y'know what? It's getting tart. There's some blooming hop tolerant Lactobacillus in there. I didn't actually want that one to be sour! Nice one, if you send me your address I'll get you something over once I have a suitable box. Brief notes from homebrew club. Thinking of a rebrew (I've got 10 bottles of this left) and this thread is hella useful . Considering adding a tiny quantity of lightly toasted oak chips. Thanks Serum!